Last week, Jan reflected on the possible meanings of the phrase “Eternal Life” so today I would like to focus on the other part of the equation – the Bread of Life. Bread is a powerful symbol for our physical life’s needs – a metaphor for all food. Even in concentration camps, in prisons, or in times of famine, people are fed bread when there is nothing else. Nicolas Madura keeps his hold on Venezuela today in part by subsidizing the price of bread. ‘Bread’ is even used as a slang expression for money – a metaphor for what you earn to buy actual bread. 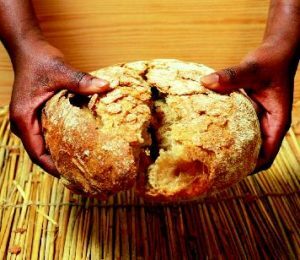 One way of thinking about the Bread of Life is that Jesus contrasted the temporary satisfaction of the body that comes from eating ordinary bread at mealtimes with the ongoing satisfaction of the soul that faith can offer. Indeed, in part of the discourse that we read last week, Jesus referred to an event in the Exodus story – “Your ancestors ate the manna in the wilderness, but this is the bread come down from heaven.” The manna saved the Israelites from starvation at the time, but they got hungry again, and in the end, they died just like everyone else. 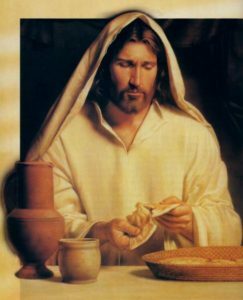 In the feeding miracle, Jesus took the bread, he gave thanks, he broke the bread, and gave it to his disciples to share with the crowd. “Take; thank; break; share” parallels our weekly Eucharistic prayers that recall the events of the Last Supper. In today’s Gospel reading, Jesus says, “Those who eat my flesh and drink my blood will have eternal life.” In the Gospel narrative, the Feeding of the Five Thousand precedes the Last Supper, which occurs at the end of Jesus’ life. Writing long after both events, the Gospel writer John already knew about the Last Supper when he put these words into Jesus’ mouth. Today’s Gospel invites us to think about what the Eucharist means for each of us. There is no one right way to think about the ‘Bread of Life” that we consume at Communion. 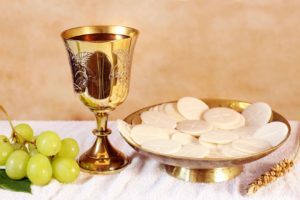 At one extreme is the Roman Church’s theology of transubstantiation, in which the prayer of consecration miraculously changes ordinary bread and wine into the actual Body and Blood of Jesus. The other extreme is that the bread and wine are merely symbols – or memorials – that re-enact Jesus’ Last Supper with his disciples. Perhaps because Anglicans always tend to compromise, the commonest Anglican theology is that of the Real Presence of Christ – that in an unspecified way, Christ truly meets us at the communion table. This is why the old Prayer Book gives thanks, in the Prayer after Communion, that “thou dost graciously feed us in these holy mysteries with the spiritual food of the most precious Body and Blood of thy Son, our Saviour Jesus Christ.” The prayer continues, “and that we are living members of his mystical body, which is the blessed company of all faithful people, and are also heirs, through hope, of thy everlasting kingdom.” Much as I like our modern Eucharistic Prayers, they do not quite capture for me this sense of the Eucharistic mystery, which as ordinary human beings, we can never quite understand. 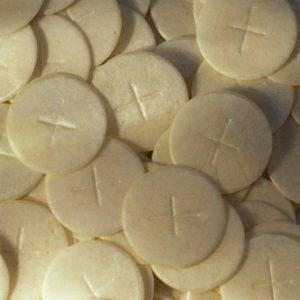 What kind of bread should be used at Communion? The earliest extant liturgy spoke only of “the many grains that we have gathered into this one bread” which we will say today in the “Breaking of the Bread”. 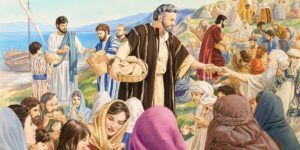 When Paul wrote to the Church in Corinth, the Lord’s Supper (as he called it), nothing was said about what kind of bread to use. It was a Eucharistic pot-luck in which everyone brought and shared. In contrast, the old Anglican Prayer Book demanded “the best and purest wheat bread, either leavened or unleavened” – thus only the best is good enough for Communion. Our communion wafers have lost a lot in translation! Martin Luther argued that the Body of Christ should be experienced in the Eucharist by being “pressed with his teeth” – he wanted the Eucharist to be physical, not just symbolic. It occurred to me this week that today’s two readings are linked by their sense of the opposite. Solomon carried out the wishes of his father. He built a Temple, a solid physical structure made of dressed stone. 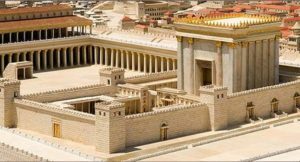 [This was the First Temple, not the one destroyed by the Romans, whose “wailing wall” remains today.] Conversely, John presents Jesus in a very other-worldly way, in which he promotes building an unearthly (or spiritual) temple in heaven or in our hearts. Physical and spiritual are alternative and complementary ways of honouring God. Just like the various interpretations of the communion bread, they are different yet both are completely acceptable. My belief is that the Scriptures admonish us to honour God and love our neighbours, without prescribing exactly how each of us should approach these tasks.